Patients with scleroderma often develop Raynaud’s phenomenon (see topic under “Diseases”). Many patients with this condition have positive blood tests (antibodies) that help to make a diagnosis. Scleroderma is divided into the localized and systemic ones. Localized scleroderma is usually followed by the skin specialist. Patients with systemic scleroderma are seen by the rheumatologist. Systemic scleroderma is further divided to limited and diffuse ones depending on the only skin involvement of the hands and feet (limited) or more pronounced skin and other organ involvement (diffuse). Occasionally, limited scleroderma can affect lungs as well. Several factors contribute to the mechanism of scleroderma: abnormalities of immune system, abnormalities in small blood vessels and deposition of excess collagen in tissues causing fibrosis (“hardness”) of the tissues. The disease is not passed from parent to child as in some genetic diseases. The cause of scleroderma is unknown. Exposure to some environmental factors may trigger scleroderma-like disease in people who are genetically predisposed to it. Suspected triggers include viral infections, certain adhesive and coating materials, and organic solvents (vinyl chloride or trichloroethylene), but no environmental agent has been shown to cause scleroderma. Women develop scleroderma more often than men. Calcinosis – deposition of calcium in tissues. (These deposits are typically found on the fingers, hands, face, and trunk and on the skin above elbows and knees. When the deposits break through the skin, painful ulcers can result). 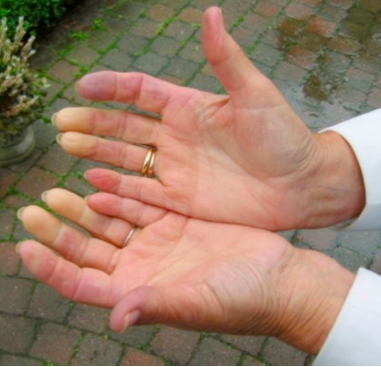 Raynaud’s phenomenon – contraction of the small blood vessels of the hands or feet in response to cold or anxiety. (As the vessels contract, the hands or feet turn white and cold, then blue. As blood flow returns, they become red. Fingertip tissues may suffer damage, leading to ulcers, scars, or gangrene). 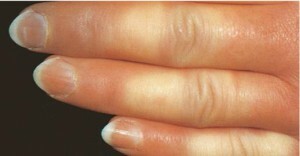 Sclerodactyly – thickening of the finger skin. (The condition makes it harder to bend or straighten the fingers. The skin may also appear shiny and darkened, with hair loss). Telangiectasias (dilated skin vessels shown on the picture below). In this form of scleroderma the diseases affects not only skin but also blood vessels and other organs (ex, kidneys, lungs or bowels). This condition may come suddenly. Skin thickening may begin in the hands and spreads quickly over much of the body, affecting the hands, face, upper arms, upper legs, chest, and stomach in a symmetrical fashion. People may feel tired, lose appetite and weight, and have joint swelling or pain. Skin changes can cause the skin look shiny, and feel tight and itchy. After first few years condition may stabilize. People with diffuse scleroderma face the most serious long-term outlook if they develop severe kidney, lung, digestive, or heart problems. Timely diagnosis and continual and careful monitoring are important. positive ANA, anti-centromere and Scl-70- antibodies. renal crisis (high blood pressure and abnormal kidney tests) 15%. Tightening of the skin on the face can cause the formation of characteristic ‘beak-like’ features and a lack of wrinkles. Patients may lose the ability to make facial gestures such as smiling or frowning. 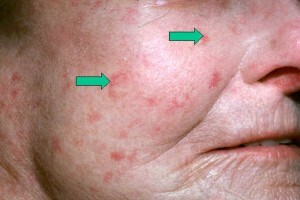 Tightening of the skin of the face may lead to microstomia – a small mouth. Facial and mouth exercises may help. Anti-Scl-70 antibodies appear in the blood of up to 30 percent of people with diffuse systemic scleroderma. Anti- centromere antibodies are found in the blood of many people (50-90% by different studies) with limited systemic scleroderma. Because not all people with scleroderma would have those antibodies and because not all people with the antibodies would have scleroderma, lab test results alone cannot confirm the diagnosis. Scleroderma is managed by a rheumatologist. Your rheumatologist may refer you to other specialists, depending on the specific problems you are having. For example, you may see a nephrologist for kidney complications, a cardiologist for heart complications, a gastroenterologist for problems of the digestive tract, and a pulmonary specialist for lung involvement. In addition to doctors, professionals such as physical or occupational therapists, psychologists, and social workers may play a role in your care. Dentists, orthodontists, and even speech therapists can treat oral complications that arise from thickening of tissues in and around the mouth. Currently, there is no treatment that controls or stops the overproduction of collagen that deposits in the skin and other organs. So, treatment is focused on relieving symptoms and limiting damage. Stop smoking (smoking narrows vessels and makes Raynaud’s phenomenon worse). Calcium channel blockers (nifedipine) can open up small blood vessels and and used to often to control symptoms. If Raynaud’s phenomenon leads to skin sores or ulcers, IV medications given in a hospital sometimes are used. Stretching exercises done regularly are important to prevent loss of joint motion. Swimming can help to keep muscles strong, and joints mobile. Tylenol arthritis or Naproxen can help to relieve joint or muscle pain. NSAIDs can increase heartburn, so should be taken with so called PPIs (losec, pariet, tecta). Occupational therapist can teach you how to perform daily tasks (Arthritis society is a self-referring service and covered by the OHIP. You can find its address under the “Useful links” section). Avoid very hot baths and showers (dries the skin). Consult an occupational therapist (Arthritis society) about special toothbrush handles and devices to make flossing easier. Ask a physical therapist about facial exercises to help keep your mouth and face more flexible. For symptom of dry mouth ask your dentist about a saliva substitute or prescription medications that stimulate saliva. Stay upright after meals. Keep the head of your bed raised using blocks. Eat moist meals and chew well. Drugs called PPIs (Pariet, Losec, Tecta) are used against heartburn. Oral antibiotics may stop bowel bacterial overgrowth, which can sometimes be a cause of diarrhea. It is usually managed by the gastroenterologist. Some patients develop lung disease: pulmonary fibrosis (scarring of lung tissue because of excess collagen) and pulmonary hypertension (high blood pressure in the artery that carries blood from the heart to the lungs). Those conditions are diagnosed and followed by the lung specialist. Watch for new symptoms of shortness of breath, difficulty breathing, and swollen feet that are unusual for you. Report these symptoms to your doctor. Have regular flu and pneumonia vaccines. Rare heart problems in patients with scleroderma include scarring and weakening of the heart (cardiomyopathy), inflamed heart muscle (myocarditis), and abnormal heartbeat (arrhythmia). Those problems can be treated by a heart specialist. Report chest pain or heart racing to your doctor. Renal crisis (kidney disease) is a rare complication in patients with systemic sclerosis and usually happens during first few years after the disease onset. Renal crisis results in severe elevation of the blood pressure followed by kidney damage. It can be provoked by the administration of steroids (prednisone) for other reasons. Patients with early scleroderma are encouraged to measure blood pressure at home on a regular basis and know what is his/her usual blood pressure. Any case of elevation of the blood pressure above usual blood pressure is concerning. For example, if patient’s usual systolic blood pressure is 110 than the increased to 160 is the significant elevation. Patient is advised to contact his/her rheumatologist. In any event of administration of steroids (ex, prednisone) to patient with scleroderma by family physician or other specialist/ED doctor patient with early scleroderma is encouraged to contact his/her rheumatologist to discuss its safety. Having a chronic disease can affect almost every aspect of your life, from family relationships to holding a job. Learn as much as you can about scleroderma. Look for support within your family and friends and through the scleroderma support group in your community. If depression makes it hard for you to function well, don’t hesitate to ask your physician for help. Patients with scleroderma may develop osteoporosis (bone mineral density test should be arranged). “Expert patient” programmes and the Scleroderma Society. Awareness of urgent problems such as renal crisis or intestinal lung disease symptoms. Physiotherapy to promote joint mobility and muscle strength. Home exercises to maintain range of motion (such as gentle mouth, face and hand stretches). Avoid tobacco and maintain healthy weight. Nutritional advice, and supplements if needed. Prevention – avoid cold and trauma; use warm clothing or heated clothing. For an attack – warm the body, hands and feet gently (the skin may be numb and unable to feel if the heat source is too hot); use gentle arm movements or gentle massage to help restore circulation. Occupational therapists – for adaptations to assist in daily living. Usually presents as accelerated hypertension (elevation of the blood pressure) with sudden decrease in urine production, headache, fatigue, swelling of the feet, and abnormal urine analysis and blood tests. Scleroderma renal crises can occur with apparently normal blood pressure, but the blood pressure is higher than usual numbers – hence the importance of regular blood pressure monitoring at home. Successful pregnancy is possible. It should be planned when the disease is stable to avoid complications. Close monitoring, multidisciplinary care and individually tailored treatment are needed. Reflux is the most common problem. The most dangerous complication is scleroderma renal crisis. Outcomes on the whole are good although there is a risk of having a premature baby. The top picture on the left shows normal capillaroscopy. 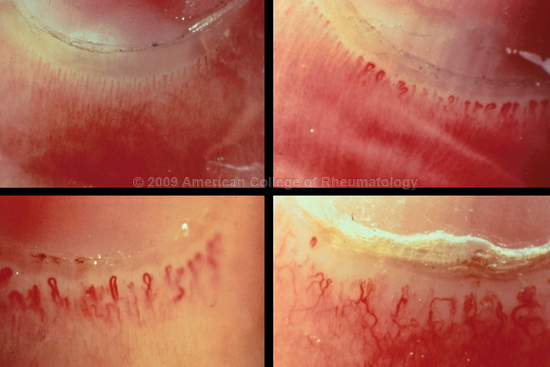 The rest pictures show different stages of blood vessel abnormalities.